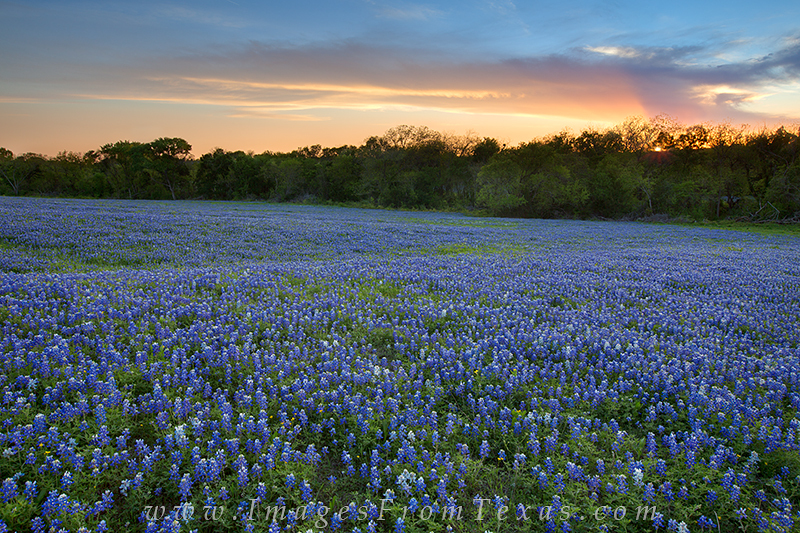 This field of bluebonnets comes from a little dirt road that was off the beaten path near Ennis, Texas. I had followed the "bluebonnet trail" but in 2013, despite rumors of solid wildflower coverage, the photographic opportunities were sparse. So I tried some of the dirt roads in the area and came across the sea of blue just as the sun was setting behind the trees. This field of bluebonnets comes from a little dirt road that was off the beaten path near Ennis, Texas. I had followed the "bluebonnet trail" but in 2013, despite rumors of solid wildflower coverage, the photographic opportunities were sparse. So I tried some of the dirt roads in the area and came across the sea of blue just as the sun was setting behind the trees. Photo © copyright by Rob Greebon.